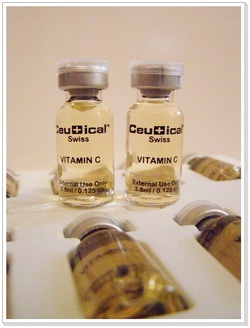 All of the Ceutical Serum images on this website by Iriana Renata is licensed under a Creative Commons Attribution-NonCommercial-NoDerivs 2.5 Malaysia License. Based on a work at ceuticalskincare.weebly.com. 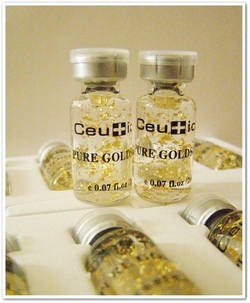 Ceutical 24K Pure Goldsome Serum. This treatment incorporates pure 24K gold in facial massage. Pure gold helps to restore collagen, assists in protection against pollution effects & damaging UV rays & helps to increase blood circulation. This serum will eliminate fine lines and wrinkles with continuous use. Helps to repair damaged skin cells and promote smooth and radiance skin tone. 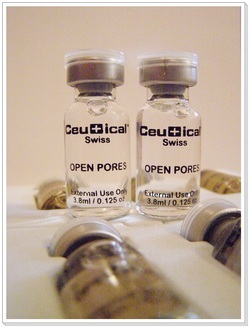 Reduce the appearances of eye bags/wrinkles/fine lines/oil seeds. Suitable for all skin types, especially for dry/uneven tone/aging/pigmented skin. 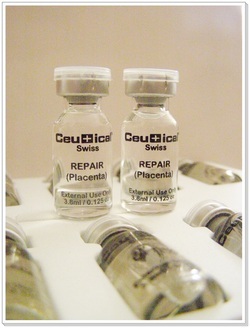 To obtain maximum results, carry out the treatment for 10-15 days. After careful cleansing, distribute the contents of the ampoule evenly over the face, neck & décolleté. Apply light massage with pinching movement until the ingredient is fully absorbed. Anti Irritation serum will sooth your skin & calm down irritation, very suitable for sensitive skin. This serum will reduce & diffuse skin redness due to irritation effectively. 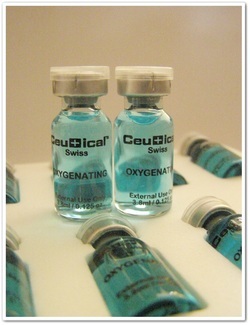 The Newest ONLY NANO technology serum available in the market! Formulated from the finest particles. 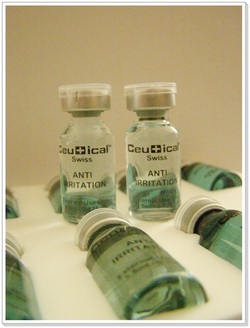 Absorption is rapid & faster compared to conventional essence, ampoule/serums. Based on a natural acne complex which regulated and balances oily skin, purifies the pores, helps regulates sebum production, soothes irritated and blemished skin. Targets acne prone skin. Soothes skin and prevent outbreak. After cleansing and toning, pour the content of one serum into the palm of hand. Gently apply to the entire face and neck area. For best result, apply the Nano Pimple Cream after using this serum to your acne/pimples. After cleansing and toning, pour the content of one serum into the palm of hand. Gently apply to the entire face and neck area. A special blend of botanical extracts specially formulated to give skin a soft & velvety feel. Renew your skin outer layer especially the epidermis layer & regenerate skin cells. Suitable for all skin types especially for dull skin & scarred skin. Simply apply this serum to your face daily and experience the difference! 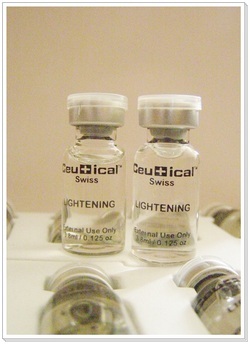 Nano lightening serum will provide aids to reduce melanin that caused dark spots & pigmentation in your skin. Eventually it will promote a brighter and radiance looking skin. 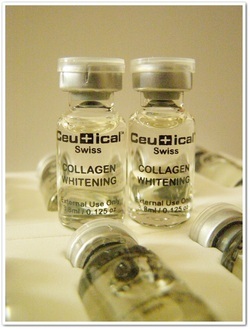 A highly concentrated collagen serum for all skin types. 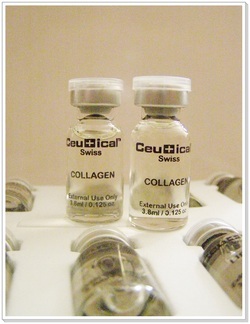 Rebuild collagen & elastin for a firmer, younger skin. Plumps up fine lines & helps boost skin's natural ability to fight environmental pollutants. This serum will act as a direct anti-wrinkle complex that will re-hydrating and firming loose and sagging skin. This unique serum provides an face lifting effect. A natural botanical active ingredient work to soften, smooth and tighten the skin. Feel your silky smooth & soft skin right away after applying this serum. Reduces any skin imperfection by giving face a clear & radiant look. 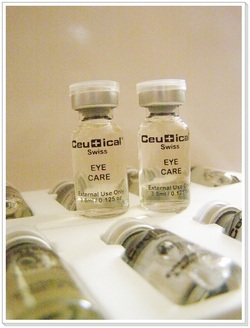 This nano eye care serum will provide lifting of the eye. Helps to reduce fine wrinkles and prevent occurrence of premature ageing. This serum contains highly concentrated hyaluronic acid to boost and maintain your skin elasticity, it will helps to keep your skin well hydrated, retain moisture, make your skin stay smooth & supple. 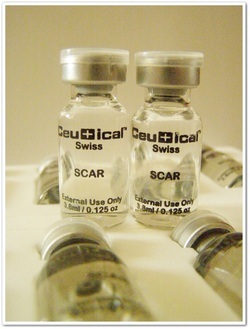 Many clinical trial has shown that hyaluronic acid is an important ingredients for wound & scar healing, also good to fights inflammatory conditions of the skin. 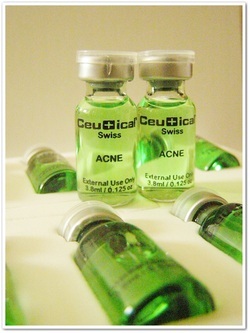 This serum is suitable for all skin types and will be very helpful for acne prone skin too. 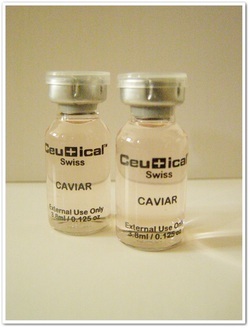 Caviar serum is suitable for all skin types. VERY EFFECTIVE in tightening and refining your skin. You can even feel the difference only after 1 application. 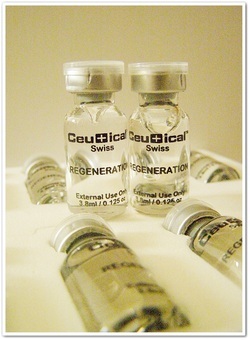 A MUST HAVE to regenerate, firm, and improving your skin elasticity. Caviar contains minerals, amino acids, vitamins, and all the goodness that your skin will ever need to keep its beauty! New technology formulated botox formulation that allows you to enhance your natural glow and effectively firm and lift tired and saggy skin. 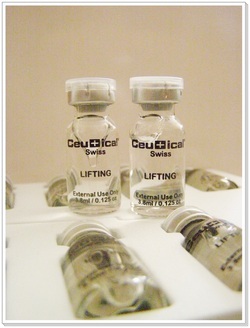 Ceutical Inverser L'Age serum will provide you the anti aging lifting effect by just applying the serum to your face, without any injection, yet you'll experience the same result, in a super affordable price. An instant experience for smoother skin!